Schengen countries are those that have signed a 1985 Schengen agreement abolishing border checks/controls and harmonizing provisions, which allow a common visa to visit all participating countries. It means that passports will only be checked and stamped if arriving from or departing to a non-Schengen country. The new Schengen Information System II (SIS II) went live on April 9, keeping track of all non-EU travelers in a central database and making it possible to search for stolen cars and weapons, missing people and criminal offenders. Note that the term “Schengen countries” does not refer to all EU member states and includes non-EU countries, such as Liechtenstein that joined December 19, 2011. Schengen visas allow travel within the entire Schengen zone, unless exceptions or exclusions are noted. If you were granted a non-Schengen or national visa, then you are only allowed passage to this specific country. There are currently 26 Schengen countries, which include 22 EU countries and four non-EU countries. Denmark — Restored passport checks & border control as of July 5, 2011, but then lifted them. Greece — At risk of being excluded from Schengen. *Although the UK and Ireland are not part of Schengen, these countries were granted policing and judicial authority in criminal matters. Croatia is part of the EU as of July 1 but is NOT in Schengen and employs 5,000 Schengen border guards. — Schengen visa holders may transit through and visit Croatia as part of the ’90-day maximum in any 180-day period’ rule — unless the visa is restricted — from January 1 to December 31, 2013, without applying for a separate Croatian visa. *See Croatia’s Ministry of Foreign Affairs web page “Visa requirements” or call the Croatian embassy/consulate nearest you to understand if you need a visa or have further questions. Bulgaria does not issue Schengen visas (Ministry of Foreign Affairs, Bulgaria), but permits all Schengen visa holders to visit and stay in Bulgaria as if it were part of the 90-day maximum stay in any 180-day period allowable in the Schengen zone as of January 25, 2012. (Sofia Echo, Sofia News Agency). It also means that many banned from Schengen pass through Bulgaria’s borders without penalty (Standart). These countries are not in Schengen, but border authorities within the country do not carry out checks. 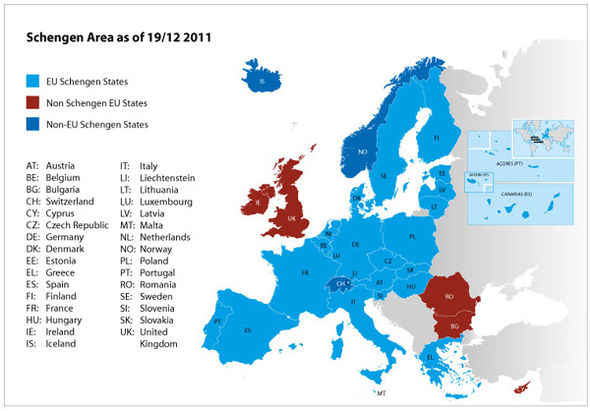 However, Schengen members that share a border with these countries typically do. Denmark reinstated partial passport checks and border controls as of July 5, 2011 and intended to restore full border security at the end of 2011 — Der Spiegel, FT. However, they have since returned to no border checks. On May 12, 2011, a majority 15 of 27 EU countries voted to restore internal border checks and passport control, or at least tighten them temporarily. In March 2012, Sarkozy said that France would suspend participation in Schengen by March 2013, but he was voted out of office May 2012. A poll published May 2012 revealed that most EU citizens want to reintroduce border controls — France (64%), Belgium (62%), Italy (62%), Sweden (59%), Spain (54%) and Germany (51%). Citizens of Britain, a country not even in Schengen, are most in favor (74%) of increased controls (WSJ). Luxembourg and Netherlands are also in favor, to stem the flow of asylum seekers (Reuters). Following complaints from fellow Schengen and EU members about lax implementation, a Council of Europe (COE) team arrived in Greece at end of May 2011 to assess gaps in border control, data management and communication between police, border control, airports, customs, coast guard, asylum and immigration authorities. A similar inspection took place in 2010, after which several deficiencies were detected. Results of a 2011 investigation say that Greece remains Schengen’s weakest link. Greece, in turn, claims that Schengen visas remain an obstacle to attracting tourists and hurting the economy, and it wants a more relaxed policy. Citizens elected neo-Nazis into Parliament, after which Greece began an illegal immigrant crackdown in August 2012 to prove it’s serious about remaining in Schengen. Largely criticized as racist since Asians and Africans are targeted, police have detained 95 percent legal immigrants, tourists and visiting businessmen. The Visa Information Systems (VIS), which stores and links the fingerprints, photo, passport and personal information of each visa applicant, was scheduled to be fully operational in all Schengen countries and all consulates issuing Schengen visas by 2014. It aims to establish a system that is fair, secure and transparent, preventing non-EU citizens from “renting” passports, “shopping” for a visas in a different countries, and alerting consulates on who was denied a visa and why. Rollout began in Africa and is set to include the Gulf from October 2, 2012, then Asia. Schengen visa applicants in countries where VIS is set up must give fingerprints as part of their application from October 11, 2011. The VIS will not initially be linked to the Schengen Information System (SIS), which stores the names of cross-border crime suspects and the movements of non-EU citizens in the Schengen zone. Though it is expected that VIS will eventually be integrated with SIS II, which went live in April 2013. As of 2011 2012 2013 2014 2015? Bulgaria and Romania were scheduled to join Schengen in March 2011, but Germany and France voiced opposition in December 2010, and an EU inspection report published July 20, 2011 cited “extreme deficiencies” in both countries in overcoming crime and corruption — The Economist. The Netherlands also vetoed entry in December 2011 and March 2012. Sweden said it would not block Bulgaria from Schengen, even after a number of its citizens were tricked across the border for non-existent fruit picker jobs in July 2012. Norway also voiced opposition in August 2013, and France in September 2013. Bulgaria and Romania did not qualify to join in 2013 or 2014 and is looking to 2015. Countries seeking to enter Schengen must gain unanimous approval by all existing member countries, then pass a final vote in European Parliament. Croatia became a full member of the EU on July 1, 2013, laying the groundwork to enter Schengen in 2015. Since the Paris shooting at Charlie Hebdo, Spain and Belgium have called for return of passport and border checks within the Schengen zone and reform of the visa policy. Cyprus was due to enter Schengen in March 2010 but is not yet a full member according to the official EU website and will be evaluated at the end of 2013 with a view to possible entry in 2016. See, “Countries in the Schengen Area.” Entrance to Schengen is believed to be partly political, and no official date to ascension has been announced. Being a citizen of a country granted visa-free travel to Schengen is not the same thing as being a member of Schengen. For example, American and Australian citizens have been granted visa-free travel to the Schengen zone for up to 90 days as explained in “Countries that enjoy visa-free travel to Greece,” but the USA and Australia are not in Schengen and never will be because these countries are not on the European continent. Schengen countries are those that have signed a treaty and met satisfactory political and economic stability requirements, plus passed strict inspections pertaining to border control, passport specifications and security checks over a period of years. 1. 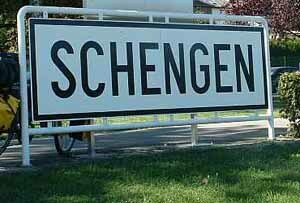 Is ___ in Schengen, or when is ___ going to join Schengen? If a country is not listed as a member or a candidate, it is not in Schengen or scheduled to join Schengen. The article is updated regularly. 2. If I have a residence/work permit from ___ , can I move to or live/work in ___ ? No. Residence/work permits from one Schengen country are not transferable to another Schengen country. Why? Schengen pertains to visas (temporary stays), not permits (permanent stays). Permits are granted on the basis on rules and regulations in whatever country issued it; it is not permission to live/work in the entire zone. There are no Schengen-wide residence/work permits. 3. If I have a residence/work permit from ___ , can I travel to or visit ___ ? Yes. If you have a valid, unexpired residence/work permit from one Schengen country, you are generally allowed to travel to and visit another Schengen member state. However, you should verify this with the country’s authorities that issued you the permit, i.e., The interior ministry, the foreign ministry, a border agency or the relevant consulate/embassy nearest your residence. No. If the country you want to visit is not on the list. Confirm with local authorities in the country that issued the permit if a visa is required. 4. If I have a Schengen visa issued by ___ , can I travel to or visit ___ ? Yes. The fourth paragraph of this article states this. If you have a Schengen visa issued by one Schengen country, you may visit all countries in the Schengen zone (those listed above) during the validity of your visa, which is usually 90 days maximum in any 180-day period. One of the countries you visit should be the country that issued you the Schengen visa, i.e., If the Greek consulate/embassy issued you a Schengen visa, then you should enter through Greece as the first country of your trip OR Greece should be on the itinerary of main countries you’re visiting. No. If you have a Schengen visa that lists exclusions or exceptions, you are not allowed to visit whatever countries are off-limits to you. Or if you went to the Greek consulate/embassy and were issued a Schengen visa, but you have no intention on visiting Greece, the country or countries you end up visiting can invalidate or cancel your Schengen visa. Why? Because it’s the law and it looks like you applied under false pretenses. 5. If I have a non-Schengen visa issued by ___ , can I travel to or visit ___ ? No. The fourth paragraph of this article states this. National visas or other non-Schengen visas are only good in the country that issued it. Countries in the EU, EEA, eurozone and Schengen all belong to a greater whole, but let’s remember that individual countries retain their separate laws and borders. 6. If I’m a non-EU citizen and acquire dual citizenship with an EU/EEA country, does Schengen still apply? Of course not. As an EU/EEA citizen you can live, work and travel freely in the EU/EEA/Schengen area because visas are unnecessary and the 90/180 rule is no longer relevant. *I do not answer questions about visas and permits for countries other than Greece, as it would be impossible to learn the laws, languages and ever-changing bureaucracy governing hundreds of visas and permits issued by all European countries. Please consult local authorities or the embassy/consulate nearest your residence that represents the country concerned. Not until 2008? I knew Switzerland had signed on, but didn’t know the date. Every time I fly I hope that it’s gone into effect already. please what about turkey. Are they a EU member or a Schengan state. Croatia is not on the list, so the answer is no. And Albania Joined Schengen Countries!!!! :P!!!!!!!!!!!! Albania and Bosnia were approved by EU Parliament on October 7 to have visa-free access to Schengen, and the EU member states’ interior ministers approved it November 8. But the visa-free status for biometric passport holders will not be in effect until mid-December. Being granted visa-free access to Schengen is a very different thing than being a full member of the Schengen zone. For example, U.S. and Canadian citizens can travel visa-free to Schengen but the USA and Canada are not part of Schengen. Albania is NOT scheduled to join the Schengen zone and has a long way to go before it can be a candidate. Se un cittadino russo con permesso soggiorno a tempo inderminato in italia decide di visitare la Svizzera ha l’obbligo di visto ? Mi pare di capire da “Stranieri,” un cittadino russo con un permesso in italia può visitare la Svizzera come un turista. Si prega di verificare con sportelli unici per l’immigrazione o polizia di stato. Grazie. i humbly want to know if is possible for some one to travel to Germany or Belgium with a Latvia visa? meaning his or her flight final destination is Latvia. and later on want s to visit the other countries of Schengen. thank u and best regards. You did not provide enough information about the visa you were given, so it is impossible to give you an exact answer. If you have a Schengen visa issued by Latvia and it does not have restrictions, you can visit other Schengen countries. If you have a Schengen visa and it has restrictions, you cannot visit the countries it lists. If you have a national visa issued by Latvia, you can only go to Latvia and pass through the airports necessary on your way there and back to your own country. You are not permitted to visit any other country. In all cases, you must follow the time restriction. For example, if the visa is for one week, you must finish all your travel in one week. If it is for 90 days, you must complete all travel and be back in your country before 90 days. will ever Cyprus join schengen? I am holding a Filipino passport and a 5 year residence card for Belgium. My Belgian husband and I are planning to go to Greece in May for vacation. Do I need to apply for a tourist visa or does it suffice to just present my Belgian residence card like what we usually do when we travel to other Schengen countries (and Greece is part of the Schengen) like France and Italy ? In “Countries that enjoy visa-free travel to Greece” and “Countries that need a visa to Greece,” I mention in both that anyone with an unexpired residence permit issued by an EU or Schengen member state may visit Greece/Schengen zone for 90 days in any 180-day period. when will Croatia, Romania, Belarus, Georgia, Turkey etc join the schengen states? Schengen is not a club that countries can easily join. Countries need meet strict rules and implementation policies surrounding air/land border security, policing, visa issuance/enforcement and data/privacy protection. It also involves several inspection visits by EU officials. Four countries you named have a long way to go as none are scheduled to join. Andorra is a landlocked, independent country between Spain and France. It is not in the EU or Schengen. Is Prague under the Schengen visa category? Answer is in the article above. Prague is a city in the Czech Republic. Is the Czech Republic on the Schengen list? If not, no. If yes, yes. All best. Hi. I’m Filipino but now I live in Italy with a regular Permit (permesso di soggiorno). I’ve entered in Italy with a Schengen Visa. Is there a possibility that I can move and work in switzerland?! I know that with my italian permit, i can stay there 3 months, but the questions is, can i transfer there and work? can i easily get a swiss working visa? When you’re granted a residence/work permit by Italy, it means you can live and work in Italy. If you decide to move to Switzerland, you must investigate whether you qualify and can be granted permission to live and work in Switzerland because it’s a separate country with completely different laws. Except under special circumstances, residence/work permits are NOT transferable between countries no matter if they are both EU or both Schengen. Having a Schengen visa does not allow you to work anywhere. Contact Italian or Swiss authorities with your question. I am an expert on Greece and have no intention on learning the bureaucracy, languages and laws of the entire zone. I am working in Switzerland and I have “Swiss B-permit”. With this permit I am allowed to travel to all the schengen countries. But I want to make sure if I can use this to travel to Croatia? Look at #3 under ‘Questions’ to find the answer. All best.